I read somewhere that parents in the Amazon or Papua Guinea when they have their first baby, they changed their name: such is the impact of welcoming a tiny human into this world. Indeed, the transformation can be overwhelming even to the most experienced of planners and organisers. This happens to my dear friend Ilaria and her plans of attending the SCOS conference (if you remember I also designed the SCOS bags and logo)that she had poured so much love and care were thwarted. Of course, being with the baby is such a joy, but it is also undeniable that at the back of new mum’s mind there is always the question of “what happened to my old life”? 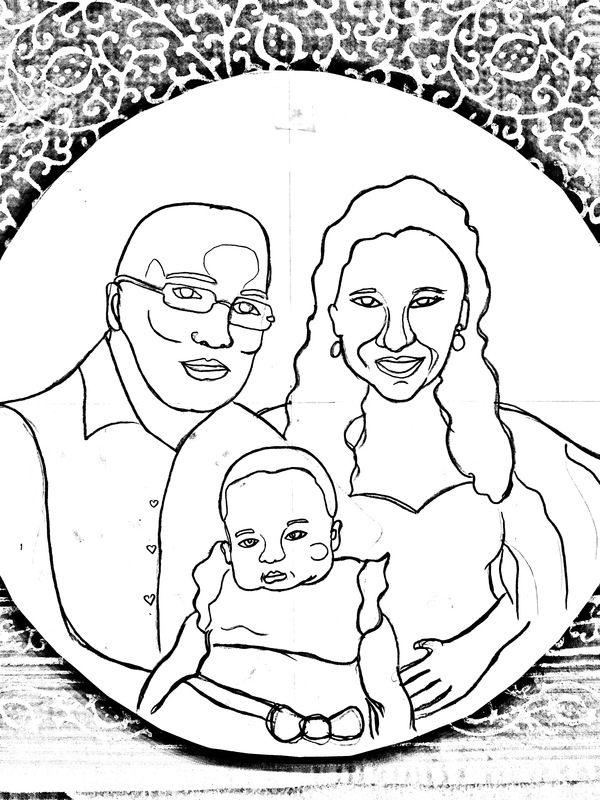 In response to that and encouraged by the great Anke, I started this Family Portrait for Ilaria, Hajid and the baby Livia. After my return from Colombia I thought about doing a series of “portraits” of my friends, merging my acquired skills in portraiture and my love for bright colours and pop imagery. I thought on the circular canvas that I used for a previous project (Love: Zoom) and luckily I had some canvas left for starting this project. The most difficult part was to keep the secrecy of this all… I had to dig in Ilaria facebook posts and find good pictures of her the family, but most of pictures were she and the baby, he and the baby… but none of the three of them. Hence, I collaged the images, and created the sketch. I used acrylics, although this has the potential of being a nice oil painting. Also, I wanted to bring together the symbology of the new family. Let me explain: Ilaria is from Rome so her dress and shawl represent the colours of her beloved city, and Hajid is from Tanzania (I had to figure that out from FB again!) so her shirt was to represent his country’s flag without being too obvious, but also using the variety of the colours to balance the chrome composition. The baby, which is an adorable little girl, was the easiest to draw: she is just an angel that binds the family together and comes to the fore, leading the future. I was so excited during the whole process and working feverishly… late at night, early next day, so I could progress in it. I bounced ideas with my art-pal Osvaldo Polo, who helped me a lot in adjusting little details and most importantly encouraging me to go on! I think also that this is a present for ever. It is portable (40 cm diameter) and it is easy to carry around. It does not have the “weight” of traditional family portraits, and it is cheerful and friendly. 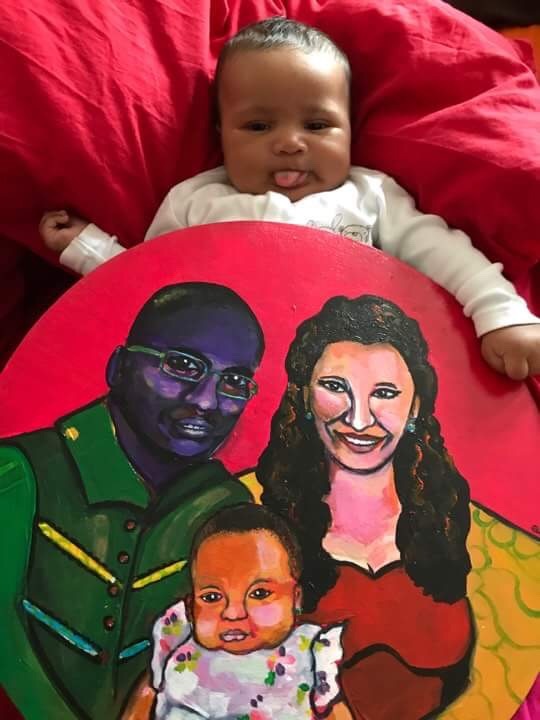 In the distant future, when her parents are no longer here, Livia would be able to recall their love and protection from the painting, and so her own children’s too… I am really proud of this painting and was very happy to see that Ilaria loved it too. If you wish to know more about Family Portraits or any other special present please let me know.